For fans of historical drama, Poldark is sure to be an instant favourite. Twice over. That’s because Winston Graham’s twelve novels have become a television series, that’s right, all over again. Transmitted in the UK between 1975 and 1977 the BBC original version traced the return of rebellious Ross Poldark (Robin Ellis) who left his Cornish home and sweetheart Elizabeth (Jill Townsend) to serve in the army. Returning to England after fighting in the American War of Independence he discovers his father his dead, his estate bankrupt and his beloved Elizabeth having had no word from him for the past six months is on the verge of marrying his cousin, Francis Poldark (Clive Francis). 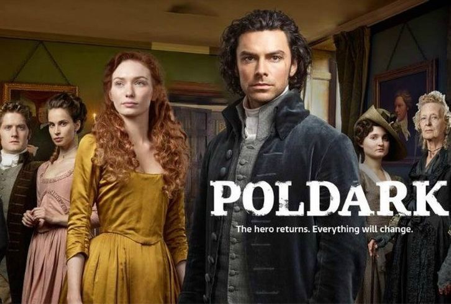 The 2015 version certainly doesn’t waver from the original storyline but it is guaranteed to become the year’s likely replacement for Downtown Abbey.With Aidan Turner as the smouldering Ross, the delicate Heida Reed as Elizabeth, Kyle Soldier as Francis Poldark and Ross’ new love interest, the downtrodden but spirited Demelza (Eleanor Tomlinson) the first episode is likely to pack quite a punch. This revisiting of the original Poldark (which ran for 29 episodes) is written by Debbie Horsfield (fans of the novels be forewarned there will be discrepancies between what was committed to those well-thumbed pages and what you see on the telly) but under the direction of Edward Bazalgette and Will McGregor it is quite a luscious feast for the senses. Stunning vistas of the Cornish coast; vast tracts of land meeting the sea and sophisticated cinematography by Cinders Forshaw certainly makes it one of the better dramas of the day. The score too is evocative and Anne Dudley’s composition takes you back to the 18th century where the romance of history sits particularly well for viewers with all the luxuries of 2015. As far as plot is concerned the first episode does well to introduce viewers to the various characters, Ross is a man who has a deep and undying passion for his lady love but he relinquishes her with dignity to his rather spineless cousin. Plunging himself into developing his rundown mines and thus incensing his uncle Charles (Warren Clarke) who would have happily seen him packed off to Oxford, he begins the slow and arduous path of finding the means to save his land and tenants. His encounter with a young urchin Demelza is gallant and like a knight of old he steps in when she is being brutally beaten and offers a chance for her to escape from the tyranny of other men by undertaking employment as a kitchen maid. Proving to be gallant defender of women he later fights against her self-righteous father and his horde of angry locals with aid from his father’s tenants who prove to be better friends than his own conniving uncle and lily livered cousin. It’s well paced and not entirely dissimilar to the twists and turns of say The Bold and the Beautiful (don’t knock it, it’s been going for over 25 years!) but has the attraction of being set in the magnificent Cornish landscape and encapsulates the various battles between the gentry and the landed classes, the tragedy of arranged marriages (a well-practised phenomena in Britain), the pining of star-crossed lovers and of course, plenty of humour from the crotchety but loyal servants of the Poldark family homestead. Watch Poldark to decide whether Downtown Abbey finally has some competition or if you don’t really care just enjoy the beauty of Cornwall.